Happy Holidays! I am always on the lookout for unique recipes to take along to holiday gatherings this time of year. 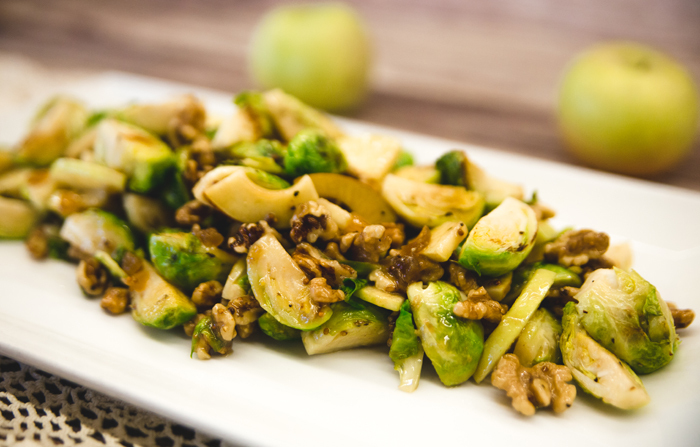 I find it helpful to have a few recipes on file that I can make the night before a luncheon or family gathering and that is why I love this recipe for Skillet Roasted Brussels Sprouts and Apple Salad. A tasty mustard concoction and onion jam give this dish its wow factor! The savory dressing is the perfect balance for slightly bitter Brussels sprouts. I recommend using Eckert's homegrown Braeburn apples because they have a terrific texture and nice red color to contrast with the green sprouts. Get it? Red and green!! And speaking of apples... we still have a terrific selection of delicious homegrown apples for sale in our Belleville Country Store. We have been storing our apples in an ethylene controlled environment which means the apples remain as crisp as the day we picked them. Ethylene naturally occurs in most fruits and vegetables and it can trigger ripening and spoilage. Naturally controlling the ethlyene levels around apples means fresher, crisper apples for a longer period of time. So come on by our produce department today and ask our staff for a sample of our delicious Braeburn apples. I hope you will give this recipe a try soon for your next holiday gathering. I promise it will be a hit! 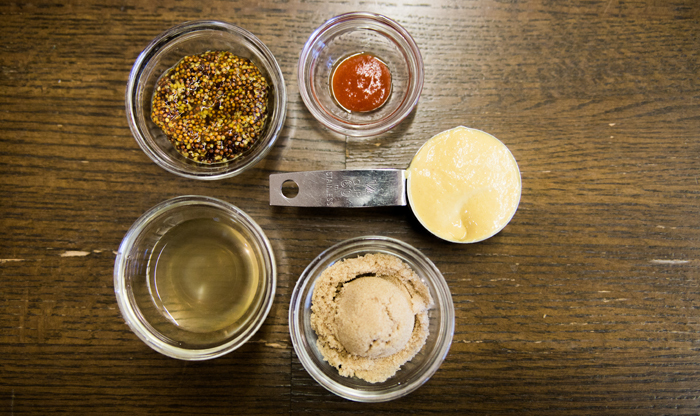 To make the mustard, use a 12-ounce canning jar with a screw top lid, add mustards, vinegar, brown sugar, and hot sauce. Shake until well mixed. Reserve 2 tablespoons mustard mixture for the salad; refrigerate the rest for up to 4 weeks. Use remainder of dressing for salad greens or as marinade for meats. To make the salad dressing, in a 4-quart bowl, whisk the onion jam, vinegar, 2 tablespoons sweet hot mustard mixture, 3 tablespoons of the olive oil, salt, and pepper. Set aside. In a 12-inch frying pan, over medium-high heat, heat the remaining 2 tablespoons olive oil. Add the Brussels sprouts, salt, and pepper. Cover and cook, stirring occasionally, until the sprouts are just tender and lightly browned, about 11 minutes. Transfer to bowl with vinaigrette, add the walnuts and apples. Toss gently covering ingredients with the dressing. Taste salad; adjust salt and pepper seasoning, if needed. Arrange salad on a large platter and serve.